Tinashe is available to book for your special event – we work in direct association with Tinashe’s representative as a booking agent for her. At the age of 3, Tinashe started her entertainment career with modeling and acting. In 2012 her mixtapes ‘In Case We Die’ and ‘Reverie’ were released and Tinashe signed with RCA Records afterwards. In 2013 Tinashe ‘s 3rd mixtape ‘Black Water’ followed and only one year later her debut studio album ‘Aquarius’, where of her debut single ‘2 On’ reached number one on the Rhythmic chart, and peaked at number 24 on the US Billboard Hot 100. 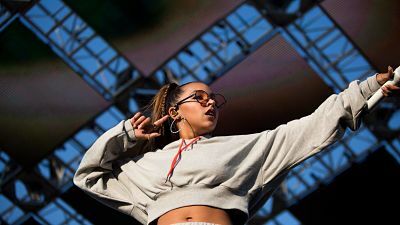 You may also know Tinashe as an actress from the films Cora Unashamed, The Polar Express alongside actor Tom Hanks, or from the series Two and a Half Men between 2008 to 2009, where Tinashe played Celeste, Jake’s girlfriend. As a booking agent for Tinashe we can organise for her to perform at your event. To hire Tinashe call Contraband Events as we can make it happen. We are booking agents for a huge selection of famous musicians to hire, and we can recommend the best artists for your entertainment. Tinashe can be booked to play at your private or corporate event through Contraband International. Make us your preferred booking agent.